A Malware named as Zeus is affecting many of the Android Devices from many years, it is being spread by attract users to a security application or banking security users from 2 years. When you will download this security software named as “Zertifikat” then it will hold of banking information by intercepting all text messages and pass them on to attacker’s own devices. Once it installed this packages will forward all the incoming messages in your mobile to one of two commands and control numbers located in Sweden with the aim of sharing secure codes and other data. If we talk about Kaspersky who warned about this Malicious app then it is basically spreading in Span, Italy and Germany. “The analysis of new Blackberry ZitMo files showed that there are no major changes. 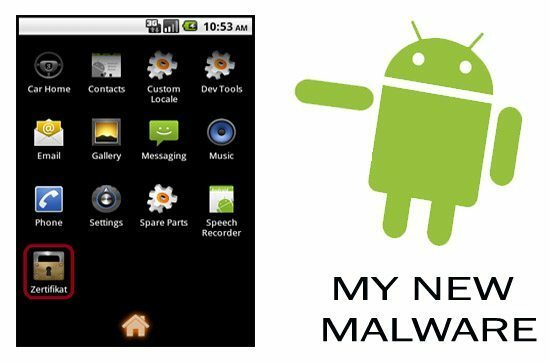 Virus writers finally fixed grammar mistake in the ‘App Installed OK’ phrase, which is sent via SMS to C&C cell phone number when Smartphone has been infected. Instead of ‘BLOCK ON’ or ‘BLOCK OFF’ commands (blocking or unblocking all incoming and outgoing calls) now there are ‘BLOCK’ and ‘UNBLOCK’ commands. Other commands which are received via SMS remain the same.” Denis Maslennikov, a researcher at Kaspersky Lab. If we come to conclusion then we can say that this type of Malware will help criminals to hijack the one time password authentication password sent via SMS and this process is used by many European Banks. Earlier this year Kaspersky had warned about many malicious app in which Zeus was one of them.